The language used by many anti billboard and general advertising blight advocates is troubling to me. 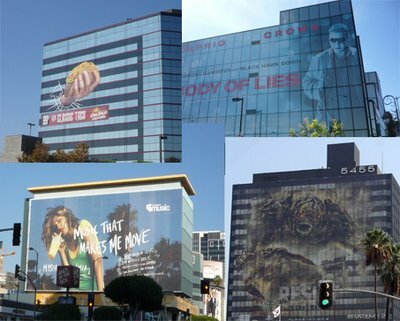 I am well aware of the fact that in our culture a legal battle is often more immediately effective in the removal of outdoor advertising than a discussion about the negative consequences, to ourselves, and our city environment. The problem is these efforts remove outdoor advertising only to see it re-posted in the same location at a later time, or moved to another place entirely. In order to fully reform our city space to function for those people who live in that space, residents must understand their relationship to the city public and what that space should offer them. I help produce the illegal billboards website, which locates un-permitted illegal signage in New York, but as far as I'm concerned all outdoor advertising is illegal. Almost a year ago, city building inspectors raised this issue at a meeting of the Board of Building and Safety Commissioners. These huge signs wrapped over the entire sides of buildings and covering windows could impede firefighters in an emergency, they said. And because almost all the signs have been put up without permits or inspections, they added, there isn’t any way to know if the material or manner of installation meets fire safety standards.